genu recurva´tum hyperextensibility of the knee joint. genu val´gum a childhood deformity, developing gradually, in which the knees rub together or “knock” in walking and the ankles are far apart; the most common causes are irregularity in growth of the long bones of the lower limb (sometimes from injury to the bone ends at the knee) and weak ligaments. The weight of the body, which is not supported properly, turns the knees in and the weak lower legs buckle until the ankles are spread far apart. See illustration. Called also knock-knee. Genu valgum in young children varies in seriousness. Milder cases may disappear after early childhood as bones, ligaments, and muscles strengthen and coordination improves. More serious cases can often be corrected by strengthening exercises and by proper manipulation of the joints. Sometimes braces are used to ensure the proper alignment of growing legs. In a very young child, genu valgum involves only the soft bone ends where the bone grows. If allowed to continue for a number of years, the condition can lead to abnormal developments in body structure. The sooner corrective measures are taken, the more effective the treatment is likely to be. Genu varum and genu valgum. 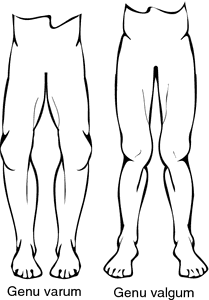 From Copstead and Banasik, 2000.
genu va´rum an outward curvature of one or both lower limbs near the knee; see illustration. Called also bowleg. a deformity marked by medial angulation of the leg in relation to the thigh; an outward bowing of the legs. /bow·leg/ (bo´leg) genu varum; an outward curvature of one or both legs near the knee. External deviation of the knee(s). A certain degree is normally present in infants, and corrects itself with bipedal ambulation; when excessive, rickets should be excluded, as vitamin D-induced osteomalacia may lead to bending of the femoral shaft bearing the mechanical brunt of ambulatory kinetics. When combined with anterior curvature of the tibia and fibula, affected children have a “saddle-sore” stance. Anterior or antero-lateral bowing of the tibia may occur in neurofibromatosis with fractures, and may be complicated by pseudoarthrosis . A deformity marked by medial angulation of the leg in relation to the thigh; an outward bowing of the lower limbs. Synonym(s): bowleg, bow-leg, tibia vara. an outward curvature of one or both legs near the knee; genu varum. If children do not outgrow knock knees or bow legs, it can affect the child's activity level, which is why parents should keep an eye on the progress of each condition. There was a total of 24 cases, which included 11 babies aged between one year and 18 months who had bow legs. RICKETS, the childhood disease which causes bow legs and soft bones, is back on the increase in Britain. The bandy bandit was caught out when security film of raids on jewellery shops showed his bow legs. A study has found that nearly 20 per cent of youngsters are at risk of developing bow legs and other bone problems simply because they don't get enough sunlight. ANGELA REPLIES: Bow legs are so common in children starting to walk that it is usually regarded as normal.